After a season, the 17/18 complicated, he Teatro de la Zarzuela He inaugurated the 18/19 with a more typical expectation and glamor of Milan Scale, but castizo. Nobody wanted to miss the event began with a poster relumbrón. Katiuska, Paul Sorozábal. After 37 years of absence in the street theater Jovellanos, He came with a cast to match any opera house ringside: Ainhoa ​​Arteta, It is acting just two days, Carlos Alvarez, whose absence this season of the Teatro Real is allowing us to see him often at his side zarzuela, Y Jorge de León. Katiuska premiered in Barcelona in 1931 and there are few occasions when he reenacted. This time the "Song of the Earth" recovers, who disappeared in recording 58 Pilar and Alfredo Kraus Lorengar. Master Sorozabal, Before die, He reviewed the work and hoped that this fragment returned to interpreted. It is at this time, and the master's hand Guillermo García Calvo, when it represented almost entirely, since they have been removed for this release some of his dialogues. The result is a short work, but agile and pace. García Calvo says that in the works of Sorozábal a closeness, poetry, frankness and affection that do not appear in any other repertoire. Something we should do feel very proud. It is set in the Russian Revolution 1917 and it is full of comic numbers, almost surrealistic, perfectly alternating with romantic music of great lyricism describing the love triangle between the three protagonists. perfectly instrumented, It has a variety of colors and tools that describe places and situations, mandolins as they bring the Russian Color. The scenery Daniel Bianco and directed by Emilio Sagi, evokes a cinematic montage inspired by the years 30 in which Katiuska opened and the divas of the time, more princesses actresses, when the film had its protagonists with ideal lives that helped break the routine to an audience delivered to their idols. It was a great frame filled with debris, those of the Tsarist regime. A colorful scenery but a little austere for or customary Sagi. I do not miss, Of course, one of his favorite elements, the moon. Ainhoa ​​Arteta, with an impressive stage presence, He plays an elegant and glamorous princess Katiuska. He noted for his pianos. Carlos Alvarez is an extraordinary moment vowel. 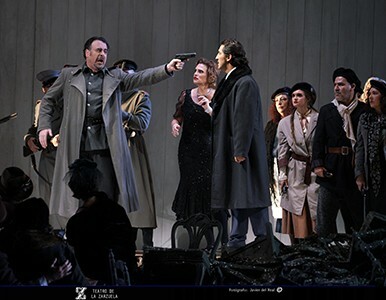 He started something intemperate but it was the big winner of the night with the baritone timbre so attractive that gave great personality to his character Pedro Stakof. Jorge de León wore her powerful voice on a difficult role, though brief, as Prince Sergio. Definitely, an evening of music and theater to enjoy that nobody should miss.